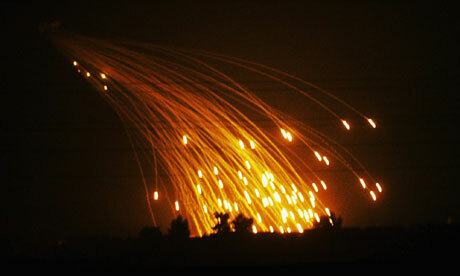 A study examining the causes of a dramatic spike in birth defects in the Iraqi city of Falluja has for the first time concluded that genetic damage could have been caused by weaponry used in US assaults that took place six years ago. The research, which will be published next week, confirms earlier estimates revealed by the Guardian of a major, unexplained rise in cancers and chronic neural-tube, cardiac and skeletal defects in newborns. The authors found that malformations are close to 11 times higher than normal rates, and rose to unprecedented levels in the first half of this year – a period that had not been surveyed in earlier reports. The report acknowledges that other battlefield residues may also be responsible for the defects. "Many known war contaminants have the potential to interfere with normal embryonic and foetal development," the report says. "The devastating effect of dioxins on the reproductive health of the Vietnamese people is well-known..."
Birth-defect rates in Falluja have become increasingly alarming over the past two years. In the first half of 2010, the number of monthly cases of serious abnormalities rose to unprecedented levels. In Falluja general hospital, 15% of the 547 babies born in May had a chronic deformity, such as a neural tune defect – which affects the brain and lower limbs – cardiac, or skeletal abnormalities, or cancers. BAGHDAD—Prime Minister Nouri al-Maliki ruled out the presence of any U.S. troops in Iraq after the end of 2011, saying his new government and the country's security forces were capable of confronting any remaining threats to Iraq's security, sovereignty and unity. 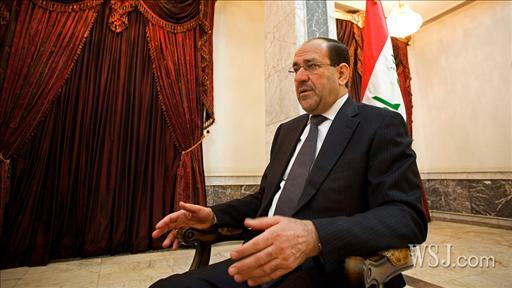 Prime Minister Nouri al-Maliki sat down for an exclusive conversation with The Wall Street Journal's Sam Dagher. Here are some excerpts. Mr. Maliki spoke with The Wall Street Journal in a two-hour interview, his first since Iraq ended nine months of stalemate and seated a new government after an inconclusive election, allowing Mr. Maliki to begin a second term as premier. A majority of Iraqis—and some Iraqi and U.S. officials—have assumed the U.S. troop presence would eventually be extended, especially after the long government limbo. But Mr. Maliki was eager to draw a line in his most definitive remarks on the subject. "The last American soldier will leave Iraq" as agreed, he said, speaking at his office in a leafy section of Baghdad's protected Green Zone. "This agreement is not subject to extension, not subject to alteration. It is sealed." Former officers and specialists say the defense industry’s political might is getting a new boost from an accelerating flow of retired generals and admirals. The Department of Defense... runs an exclusive job service to teach soon-to-retire generals how to land jobs in the defense industry. And military firms routinely recruit elite officers while they are still in uniform. Intense competition for contracts is helping drive the industry’s insatiable desire for influential and well-connected insiders. Numerous times this year, members of Congress have held fundraisers and collected big checks while they are taking critical steps to write new laws, despite warnings that such actions could create ethics problems. The campaign donations often came from contributors with major stakes riding on the lawmakers' actions. For three weeks in June, for instance, the members of a joint House and Senate committee worked to draft final rules for regulating the financial industry in the wake of its 2008 meltdown. During that time, the 35 members of the drafting committee collected $440,000 in donations from that same industry, which was then lobbying heavily for looser rules. In September, the Senate voted on what it considered one of the year's most important pieces of legislation, the Small Business Job Creation Act. The bill, which later became law, created a $30 billion loan fund for community banks and gave them incentives to lend the money to small businesses. Hundreds of lobbyists were registered to lobby on this legislation, in part because it meant more business for banks. Guantanamo is coming up on its ninth anniversary -- a horrifying stain on the character of the US commitment to justice. President Obama knows well that Guantanamo is the most powerful recruitment tool for those challenging the US. Unfortunately, this proposal for indefinite detention will prolong the corrosive effects of the illegal and immoral detentions at Guantanamo rightly condemned world-wide. The practical, logical, constitutional and human rights problems with the proposal are uncountable. Recall that dozens of the very same people who would now be subject to indefinite detention have already been cleared for release by the government. How can indefinite detention of people we already cleared to go home possibly be legal? ... "Freedom from bodily restraint has always been at the core of the liberty protected by the Due Process Clause from arbitrary governmental action." The Supreme Court has "always been careful not to "minimize the importance and fundamental nature of the individual's right to liberty." Foucha v Louisiana, 504 US 71 (1992). The Washington Post team of Dana Priest and William Arkin have again pushed the envelope on what the mainstream media report on US government surveillance of citizens. I expect that, as happened congruent to Priest and Arkin's stories on "Top Secret America" published last July, the Post will build a site with a linked set of materials online over the next several days. Scroll down to the bottom of page 1 to see some of this material. The Post findings paint a picture of a country at a crossroads, where long-standing privacy principles are under challenge by these new efforts to keep the nation safe. * In Arizona, the Maricopa County Sheriff's Facial Recognition Unit, using a type of equipment prevalent in war zones, records 9,000 biometric digital mug shots a month. * U.S. Customs and Border Protection flies General Atomics' Predator drones along the Mexican and Canadian borders - the same kind of aircraft, equipped with real-time, full-motion video cameras, that has been used in wars in Kosovo, Iraq and Afghanistan to track the enemy. The special operations units deployed overseas to kill the al-Qaeda leadership drove technological advances that are now expanding in use across the United States. On the front lines, those advances allowed the rapid fusing of biometric identification, captured computer records and cellphone numbers so troops could launch the next surprise raid. Few devices know more personal details about people than the smartphones in their pockets: phone numbers, current location, often the owner's real name—even a unique ID number that can never be changed or turned off. These phones don't keep secrets. They are sharing this personal data widely and regularly, a Wall Street Journal investigation has found. Reuters makes big news of a study showing that Glaxo's swine flu vaccine (which contains ASO3 adjuvant) induced a stronger immune response than an unadjuvanted Baxter vaccine. This is nothing to crow about. Everyone agrees that adjuvants boost the immune response; the question is how much increased autoimmune illness or other adverse events occur as a result of the adjuvant boost. Norman Baylor, director of FDA's Office of Vaccine Research and Review, told Science magazine that antigen-sparing strategies [using a cheaper adjuvant to reduce the amount of antigen in vaccine--Nass] benefit populations, not individuals. "You have to think about those trade-offs," Baylor said. Another issue is whether the "stronger immune response" actually prevents flu in more people. Data from many studies of flu vaccines show that the vaccines are up to 75% effective at preventing flu, when the vaccine strains match the common circulating flu strain(s). So far, there is no evidence that adjuvanted vaccines do better than 75%. Furthermore, flu vaccines do not lead to reduced hospitalizations or complications from influenza (which is what causes flu-related deaths) and there is no evidence adjuvanted vaccines do either. So the higher levels of antibodies achieved with adjuvanted vaccines may not produce any clinical beneft whatsoever. Where are the data from the US and the rest of Europe and Australia on narcolepsy incidence following swine flu vaccinations? Why have Sweden and Finland seen a steep rise in cases? What other neurologic disorders, if any, have occurred at increased incidence? These are only some of the questions that must be answered prior to adopting novel adjuvants for general use. Forty one children and young people in Finland who were vaccinated for the H1N1, or swine flu virus last winter have been diagnosed with narcolepsy. In addition, there have been a few cases of the disease in which there was no record of a swine flu vaccination. Sweden and Finland are the only two countries to report a surge in narcolepsy the same vaccine was used in Canada, where there were only a few cases of the disease. Narcolepsy has been on the increase in Finland in the past ten years, but not among such young patients. The symptoms of the young victims have been more severe than usual. “Kataplexy, the sudden loss of muscle tone in connection with a strong emotional state, has not been this common before”, says child neurologist Outi Saarenpää-Heikkilä of the Tampere University Hospital. Although the increase in cases of narcolepsy coincides with the vaccines, there is still some question as to whether or not it was actually the cause. If WikiLeaks had been around in 2001, could the events of 9/11 have been prevented? The idea is worth considering.The organization has drawn both high praise and searing criticism for its mission of publishing leaked documents without revealing their source, but we suspect the world hasn't yet fully seen its potential. Let us explain. The 9/11 Commission ultimately concluded that Moussaoui was most likely being primed as a Sept. 11 replacement pilot and that the hijackers probably would have postponed their strike if information about his arrest had been announced.WikiLeaks might have provided a pressure valve for those agents who were terribly worried about what might happen and frustrated by their superiors' seeming indifference. They were indeed stuck in a perplexing, no-win ethical dilemma as time ticked away. Their bosses issued continual warnings against "talking to the media" and frowned on whistle-blowing, yet the agents felt a strong need to protect the public. Today, the Daily Mail publishes for the first time the legal document which could trigger a full coroner's inquest into the death of Dr David Kelly. The document, formally known as a memorial was written by group of campaigning doctors who have been trying to secure an inquest since 2004. The memorial argues that Dr Kelly’s death was not sufficiently investigated and claims that there are a large number of irregularities surrounding it.It names Lord Falconer, once Tony Blair's flatmate and in June 2003 appointed Lord Chancellor, as the architect of the public inquiry into Dr Kelly's death chaired by Lord Hutton. The memorial addresses - and answers - each of the six legal points necessary for a coroner's inquest to be re-opened. Under section 13 of the Coroners Act 1988 only one of these points has to be satisfied for an inquest to take place. FBI's newest gambit is intended to reshape the (FBI-purchased) National Academy of Sciences study of FBI's science (FBI clearly wasn't happy with the almost-published report it was given to review), as FBI tries to retain control of the anthrax letters narrative. The FBI has belatedly provided an expert panel with new information that will delay a long-awaited report on the scientific merits of the government's investigation into the deadly 2001 anthrax mailings... The academy panel submitted the report to the FBI on 27 October. On 3 December, FBI officials provided new material and asked for an opportunity to make a presentation before the committee. A New Jersey congressman has called the request "disturbing" and asked the FBI for an explanation. In a letter to FBI Director Robert Mueller Thursday, Democratic Rep. Rush Holt said that it appears that the FBI "may be seeking to try to steer or otherwise pressure the NAS panel to reach a conclusion desired by the bureau." Holt, a scientist and the chairman of the House Select Intelligence Oversight Panel, said the academy recently shared with the bureau its draft report on the "Amerithrax" investigation, a narrow scientific review that the FBI requested in 2008 in an effort to quell controversy over its findings that a disgruntled government scientist was behind the attacks. "This week I was informed by the NAS that the FBI would be releasing an additional 500 pages of previously undisclosed investigative material from the Amerithrax investigation to the NAS," he wrote. Holt said he understands that the "document dump . . . is intended to contest and challenge the independent NAS panel's draft findings." The FBI's move came as a surprise to the academy. Spokeswoman Jennifer Walsh said on Nov. 30 the committee was finalizing its report for the upcoming release, and in a Dec. 10 e-mail she wrote "at that time we didn't know we would receive any relevant information. "We were surprised given our prior request for all relevant information," she said. "Some, but not all, of what the FBI has now turned over is relevant to the committee's charge, and they are the type of materials we requested previously. However, I can't characterize what types of materials they are." Information on Congressman Holt's response to the latest FBI trick and his letter to FBI Director Mueller can be found here. Calls for an inquest are made anew as lack of fingerprints on the two items supposedly used to commit suicide, (3 packs of ten Co-proxamol [Darvon plus Tylenol] tablets and a pruning knife) becomes public knowledge. Note that blood levels of Darvon and Tylenol were therapeutic, and did not support any overdose. Why Kelly would choose a pruning knife instead of a razor blade is another question, especially since the knife had no fingerprints on it and there were no gloves at the death scene. This case is as ridiculous as the case against Ivins for the anthrax letters. For Kelly there was no inquest, either--and the doctor who performed the autopsy, Nicholas Hunt, missed major findings, claiming the "overdose" that wasn't one contributed to Kelly's death. A 2010 update to Cochrane's 2007 metaanalysis of the published clinical trial literature on influenza vaccinations found not a lot to recommend the vaccines. Cochrane pointed out, "Healthy adults are presently targeted mainly in North America." The implication is that Europe, where most reviewers reside, is too smart to push mass flu shots on its healthy population. In the relatively uncommon circumstance of vaccine matching the viral circulating strain and high circulation, 4% of unvaccinated people versus 1% of vaccinated people developed influenza symptoms (risk difference (RD) 3%, 95% confidence interval (CI) 2% to 5%)... Vaccination had a modest effect on time off work and had no effect on hospital admissions or complication rates. Inactivated vaccines caused local harms and an estimated 1.6 additional cases of Guillain-Barré Syndrome per million vaccinations. The harms evidence base is limited. CONCLUSIONS: Influenza vaccines have a modest effect in reducing influenza symptoms and working days lost. There is no evidence that they affect complications, such as pneumonia, or transmission.WARNING: This review includes 15 out of 36 trials funded by industry (four had no funding declaration). An earlier systematic review of 274 influenza vaccine studies published up to 2007 found industry funded studies were published in more prestigious journals and cited more than other studies independently from methodological quality and size. Studies funded from public sources were significantly less likely to report conclusions favorable to the vaccines. The review showed that reliable evidence on influenza vaccines is thin but there is evidence of widespread manipulation of conclusions and spurious notoriety of the studies. The content and conclusions of this review should be interpreted in light of this finding. The manufacturer of the only licensed anthrax vaccine (Emergent Biosolutions, a.k.a. Bioport) purchased the company from the state of Michigan in September 1998 immediately after the Army promised to indemnify the company (provide a free insurance policy) against claims for side effects, lack of efficacy and other potential problems. The language in the contract was questioned at the time, as the vaccine manufacturer received indemnification protection as if it were doing far more hazardous work than simply making a vaccine. And it was the taxpayer that would foot any bills. Several high-profile military contractors pushed for and won legal indemnity from the Pentagon before starting projects that involved exposure to chemical weapons and other highly hazardous substances, according to documents released yesterday by Rep. Earl Blumenauer (D-Ore.). The data uncovered by Blumenauer shows that the Pentagon paid legal bills for at least one firm that invoked its indemnity provisions. Emergent BioDefense Operations Lansing Inc., manufacturer of an anthrax vaccine widely used by the military, was reimbursed for nearly $650,000 after billing the Army for more than $1.5 million in 2008. The original Pentagon memo granting indemnity to Emergent described, as did the KBR contracts that prompted the National Guardsmen's lawsuits, the nature of the "unusually hazardous" risks facing the biotechnology company. Oregonians on Wednesday successfully amended the House Defense Authorization bill to spotlight who pays when a defense contractor causes harm.